Another winter storm is coming, but the pain will be brief. Don’t put away your winter gear quite yet. The first flowers are sprouting in NYC’s Central Park, baseball season is starting up, and Minnesota has almost run out of road salt. But apparently winter’s not done yet. That’s what is headed our way on Wednesday, to bring a superfluous coating of flakes from Chicago to Maine. This may be the storm that breaks the all-time snowfall record in places like Indianapolis and Detroit. There is good news: As of now, it appears the worst of the snow should miss the big cities of the East. If you live in the cyan area, more than a foot of snow is coming to get you. Map by NOAA Weather Prediction Center. The bad news: In lieu of a debilitating snowstorm, Washington, Philly, New York, Boston, and points in between will get a lashing of cold rain, which will probably feel like just about the worst thing imaginable if you happen to be caught outside late Wednesday night. Winds could be sustained around tropical storm force near the coast, with brief gustier blasts of up to 50 mph. The storm should be a quick mover, and even the big cities on the coast could get a bonus two inches or so of snow as it moves out during the overnight hours on Wednesday and the blustery cold air ramps up. The cold, too, will be quick—and probably enough to flash-freeze puddles from the previous day. But just as quickly as this whole mess will appear, a warm-up will get underway. The coldest of the frigid air will really stick around for only about 24 hours before retreating back from whence it came (Canada). The nadir of the wintery abomination on the East Coast will be from Wednesday evening through Thursday. Temperatures will dip well into the teens on Thursday morning from Washington, D.C., to New York City to Boston. Temperatures should be back into the 50s in NYC by the weekend. In which the color scale actually starts to fold in on itself due to extreme coldness. Monday’s 00Z GFS model showing Thursday morning’s frigid low temperatures via American Weather. It’s unlikely that New York City’s Central Park will break Thursday’s daily low temperature record of 6 degrees set way back in 1888, but here’s hoping. At this point, it would be one more memento in a trophy room full of recent cold weather championships. Speaking of records, the adept Bob Henson at the National Center for Atmospheric Research has an excellent review of this “winter of our disbelief”—if you’re the type who likes to bathe in the warm glow of statistics in an attempt to rekindle the feeling in your fingertips. 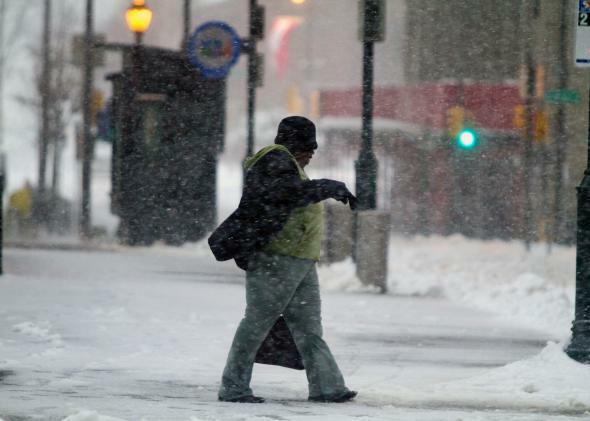 Polar vortex veterans may scoff at the feeble ineptitude of this week’s snow and Arctic blast–NYC’s wind chills will barely be below zero, after all—but for crying out loud, it’s almost St. Patrick’s Day. As least the pain will be brief this time.